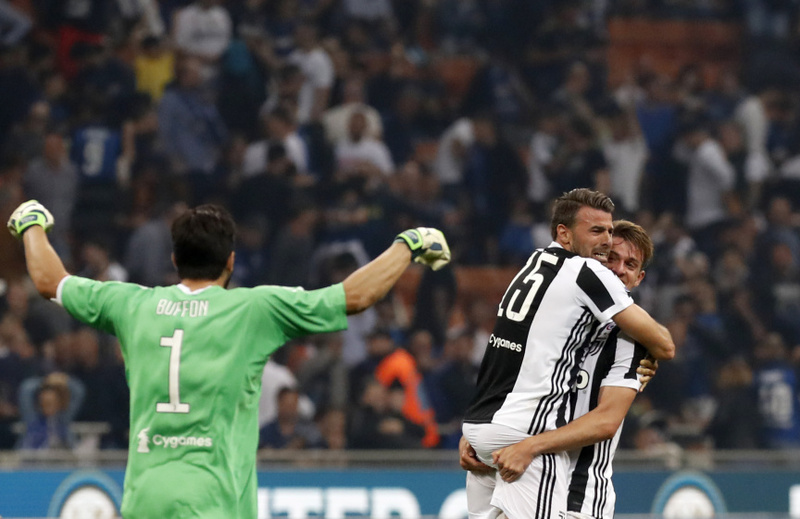 ROME (AP) — Juventus scored two late goals to rescue a 3-2 win over 10-man Inter Milan in a wild Derby d'Italia on Saturday and stay on track for a record-extending seventh straight Serie A title. Juan Cuadrado and Gonzalo Higuain scored in the final four minutes as Juventus moved four points ahead of Napoli, which visits Fiorentina on Sunday in a tense title race. "This is the hunger, pride and thirst for victory that this squad possesses. We will fight to the death to win," Higuain said. 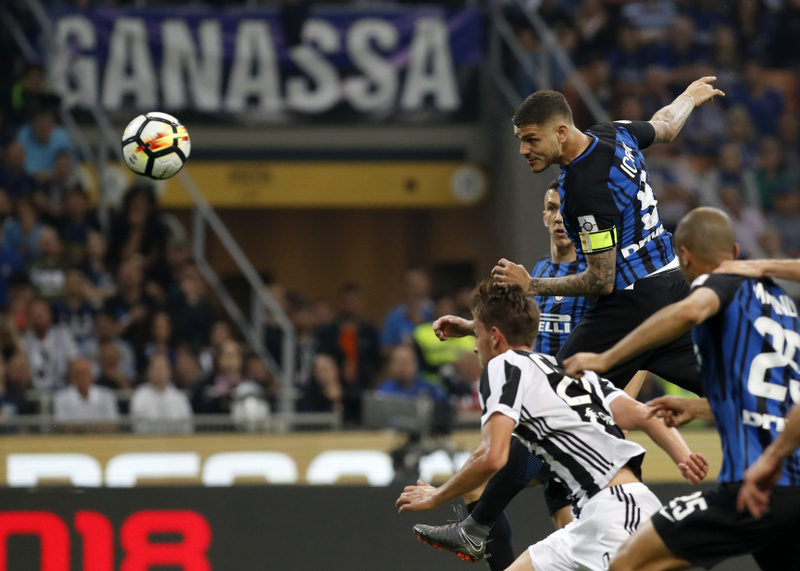 After Douglas Costa's early opener for Juventus, Inter equalized after the break with a header from captain Mauro Icardi then went ahead with an own goal from Juventus defender Andrea Barzagli. The victory ended a run of two straight matches in which Juventus dropped points, having drawn with relegation-threatened Crotone and lost to Napoli at home last weekend. Inter remained fifth, one point below the Champions League places. "Inter played well, but got tired in the end, crumbled physically and we took advantage," Juventus coach Massimiliano Allegri said. "It's another step towards the Scudetto, even if it remains very difficult." Early on, it was all Juventus. Douglas Costa scored with a decisive half-volley, extending the Brazilian's streak of being involved in the last six Juventus goals in Serie A: Two goals and four assists. Inter midfielder Matias Vecino was sent off for a foul on Mario Mandzukic in the 18th. Referee Daniele Orsato originally pulled out a yellow card but changed to red after a video review. Vecino stepped on Mandzukic's ankle and the Croatia international later showed a deep cut. Inter stepped up after the break. Icardi rose above Juve's defense to redirect a free kick into the far corner with a glancing header — his eighth goal in 11 Serie A matches against Juventus. Then in the 65th, Cuadrado couldn't handle Perisic on the left flank and lied down instead to avoid picking up a second yellow card. Perisic then crossed toward Icardi but the ball bounced in off Barzagli. Cuadrado made up for the error by scoring from a tight angle with a shot off Inter defender Milan Skriniar in the 87th. Then Higuain ran past Inter's defense to head in Paulo Dybala's free kick two minutes later to complete the comeback. Allegri was sent off after Higuain's winner for entering the pitch in an attempt to get his players to stop celebrating and refocus for the final minutes. "There were four minutes to go ... I didn't want a repeat of Madrid," Allegri said, referring to the Champions League elimination by Real Madrid. Displaying the offensive firepower it will need in the Champions League semifinals, 10-man Roma defeated visiting Chievo Verona 4-1 in convincing fashion. Edin Dzeko scored twice, Patrik Schick and Stephan El Shaarawy also found the target, and Roma goalkeeper Alisson saved a penalty. Roma also hit the post twice. Roberto Inglese pulled one back late for Chievo. A similar result on Wednesday would allow the Giallorossi to overturn a 5-2 deficit to Liverpool. "Now we have to recover our physical and mental energy, leave the field on Wednesday knowing we've done all we possibly could," Roma coach Eusebio Di Francesco said. "We've proved in the past that we can achieve great results in the Champions League, so we must all believe, that is my slogan." Meanwhile, the victory strengthened Roma's chances of returning to the Champions League next season. Third-placed Roma moved three points ahead of Lazio, which visits Torino on Sunday. Chievo remained two points above the relegation zone. Empoli secured promotion into Serie A after only one season in the second division. Empoli moved 14 points ahead of Parma and Palermo after drawing with Novara 1-1 and was assured of winning Serie B with four rounds remaining. The Tuscan squad is coached by former Roma manager Aurelio Andreazzoli.